Once upon a time, a TV was just one piece of a three-part puzzle. You needed the TV itself, you needed a pay TV subscription to watch live entertainment, and then you needed a streaming media device for on demand content services like Netflix and Hulu. So you had to spend over $1,000 on a good quality TV, another $50-$100 on a media streaming box, and $100+ each month for cable. Well, those days are long gone. 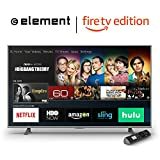 The Element 55-Inch 4K Ultra HD Smart LED TV – Amazon Fire TV Edition is a perfect example of how far we’ve come. It’s a gorgeous 4K television and a media streaming device in one, thanks to built-in Fire TV software. Then you can also subscribe to a live TV service like SlingTV through Fire TV, which means you don’t need cable. At its normal price of $650, this Element TV is an absolute steal. At $399.99 today only for Prime Day 2017, it’s nothing short of pure insanity. Don’t miss this one.